I kicked off my L. M. Montgomery-related reading challenge this year with a book that’s sat on my shelf unread for a while (I love when challenges get me to read unread books I own! 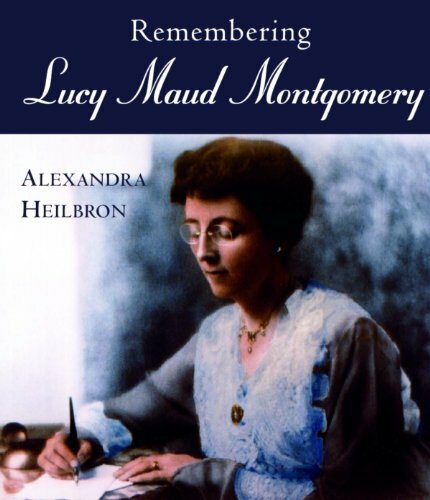 ): Remembering Lucy Maud Montgomery, edited by Alexandra Heilbron. I’ve seen it said elsewhere that Montgomery’s novels reflect the sunnier side of her personality (with their pastoral scenes, romances and happy endings), while her journal was her grumble book for her darker pains and worries (especially in the last few years). This book tries to fill in a third side, the face people around her knew. It’s a series of interviews with people who knew her, about what they remember. This book is a brilliant idea that came thirty years too late. Montgomery died in 1942, and the book was published in 2001, nearly 60 years later. Since Montgomery was herself in her sixties when she died, simple math and the human lifespan indicates that people interviewed must have been much, much younger than she was. Despite that, the book starts out relatively strong, interviewing relatives who, though children at the time, seem to have some genuine insights into who she was and how she related to their family. One fun note, among the relatives’ interviews and elsewhere, is that she routinely talked to herself, while she was plotting out stories and shaping dialogue. She mentions in her journal that she thinks stories out before writing them down, but doesn’t describe speaking them aloud. The best relatives’ interviews are from a series of nieces and nephews, though there was one from her granddaughter, who had surprisingly little to add. There’s also a series of interviews with Mongomery’s housemaids, all of whom seemed to like her quite well although one felt she was treated shabbily at the end when Montgomery turned her off (slightly ahead of a planned leaving) after she and her boyfriend read Montgomery’s journal. Have to say, I’m in Montgomery’s camp on that one. The book deteriorates a bit after that, into interviews with a crowd of people who knew Montgomery as a neighbor or Sunday school teacher, and here’s where you really feel the age issue. How much insight can a then-ten year old really have about an adult woman, especially the minister’s wife who has an image to maintain? It’s an impressive array of people who have some memory, considering the timeline, but the memories are limited. And I’m not sure why the editor kept asking about Montgomery’s clothing (maybe it’s just me, but that doesn’t seem like a very interesting line of inquiry). The most interesting insights the children had were actually about Montgomery’s family. They seem to bear out what the journal (and a biography I’ve read) suggests, which is that Stuart was the likable one, Chester more difficult. The opinions on Montgomery’s husband Ewan are interestingly split. He had serious mental problems, so it’s easy to imagine that some people encountered him on a good day, others on bad. It’s too bad that a book like this couldn’t have been done decades sooner, to speak to Montgomery’s contemporaries or friends. I can see how that would be a whole different level of complication around privacy or what they’d be willing to share…but some candid interviews with her close friends Frede or Laura (impossible, they both pre-deceased her), her cousins or her beaux…now that would be fascinating. Well, it would be if you’re deeply interested in Montgomery, at least! As it was, this was a bit fun and had a few nice notes in it, though for getting a view of Montgomery’s life outside her own lens in the journal, I found the biography, The Gift of Wings by Mary Rubio, to be much more effective and insightful. Still, check another off on Montgomery obscuria I’ve now read! If Montgomery was a private person (as she seemed to be in keeping a journal), she probably wouldn’t have wanted her close friends to talk about her. Times have changed on that score now, where people talk without permission of the subject, or speak anonymously.